Is this Britain’s worst Christmas tree? 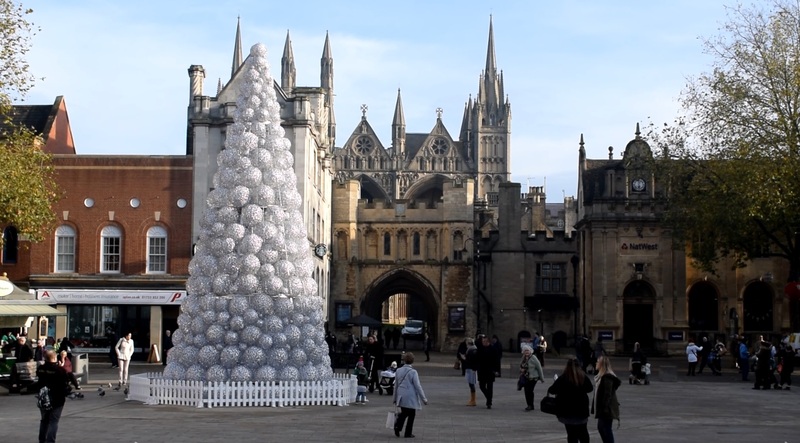 Peterborough City Council has come under criticism for this year’s tree situated in the market square. The tree, which is being used in the city for the second year running has recently been featured on the BBC article “Are these Britain’s worst Christmas Trees?” and has been described as “an abomination” by locals after its erection and switch on in the market square last week. A Peterborough City Council spokesman said, “Like all decorations, the city’s new Christmas tree will look at its best once it’s lit up. “This new contemporary tree stands at ten meters tall and will be the focal point of the festive display on Cathedral Square. “We continue to develop the city center as a regional shopping destination and festive displays help to encourage visitors to our city and support local businesses and jobs. There are claims that the tree shows a saving to the tax payer with over £80,000 having been spent each year on Christmas decorations across the market square before the tree was bought. However, despite the public outcry it looks as though the tree is here to stay with a council spokesman saying that the tree “will last for at least five years”. The full article in print, can be found by clicking here. This entry was posted in Other and tagged 2016, england, peterborough, winter, worst christmas tree by sleafordtom. Bookmark the permalink.